White is just not the best color to mention to a person who has dug out of two snow storms in the last two weeks and is expecting another one today. I love the snow, but it can get tiring. Right now the snow is too deep for cross-country skiing, and my dog is too small to leap around in it. I'd like to go back to last month's snow coverage. I'm not complaining too much; I rather have it white outside than gray. It is always brighter and prettier to look out side and see snow than to see what is under it… dead stuff. But salad that is all white is another story?… hmm, all white food in general just doesn't seem that appealing. Bright colors are just so much more appetizing, so I had to close my eyes to give this salad a try. 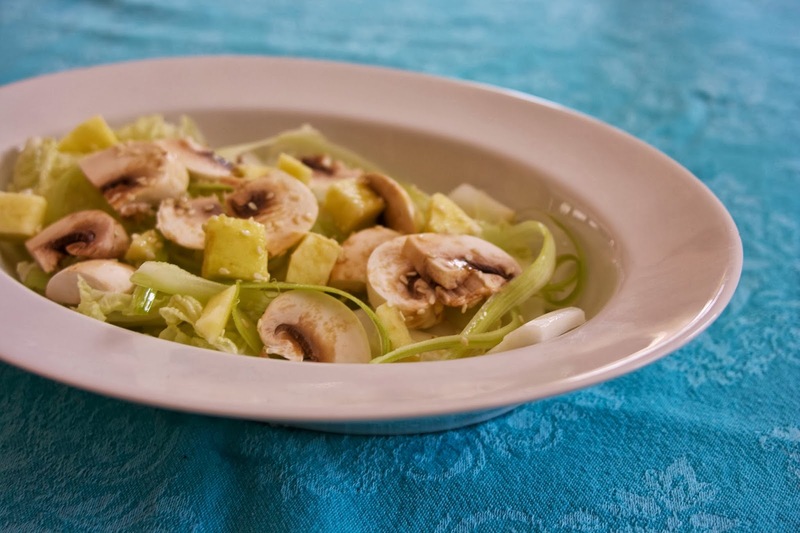 It is a mixture of napa cabbage, celery, granny smith apples, and of course, white mushrooms. As a matter of fact, the more I ate of this salad the more I liked it. The flavors are very delicate. I usually make vinaigrette salads, so not having a pucker you mouth experience from vinegar was a pleasant change. 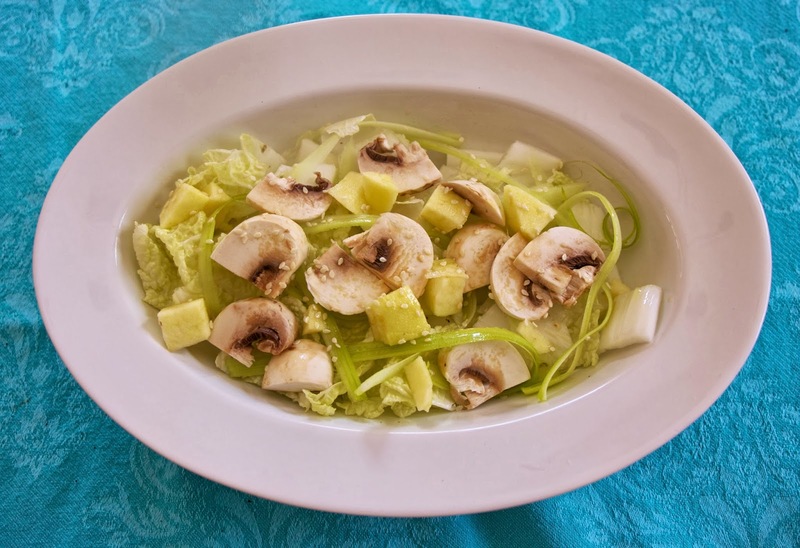 Napa cabbage is a nice diversion from green leaf salad, and the bits of apple were really pleasantly contrasting to the mushrooms and celery. This is a true side dish salad. It will not compete with anything else you are serving. Perfect with a delicate piece of fish or chicken in a light sauce… anything really. Helene's All White Salad is about subtlety. It is a soft blanket of snow. Gentle and quiet… easy to enjoy. First of all - these photos are stunning!! And I'm quite jealous. Here the weather is warm and we are praying for some rain! The snow is beautiful, but it has been bitter cold. This is a lovely salad I hope you try it. Your salad looks lovely. The photographs are really nice. Funny, I had the opposite experience I liked more when I first made it and not as much later, but it may have been the spicy chicken I had it with was overpowering. I'm a big fan of your sweet pup...but not so much of a fan of this salad. Glad you enjoyed! Lila is with you. I dropped a little cabbage on the floor when I was making it and she sniffed it and ran away. Good writing and lovely pictures. This salad grows on you! Exactly, it grows on you Emily. Each bite got better. We're on the same page this week. I was not expecting to like this one (who would with a name like that) but I did and will probably even make it again. With the cabbage I think that it makes a great winter salad. This winter I ate a lot of cole slaw. I have been craving raw cabbage which is a really healthy winter food, so this salad is another way to get my cabbage fix. I think I like more raw! 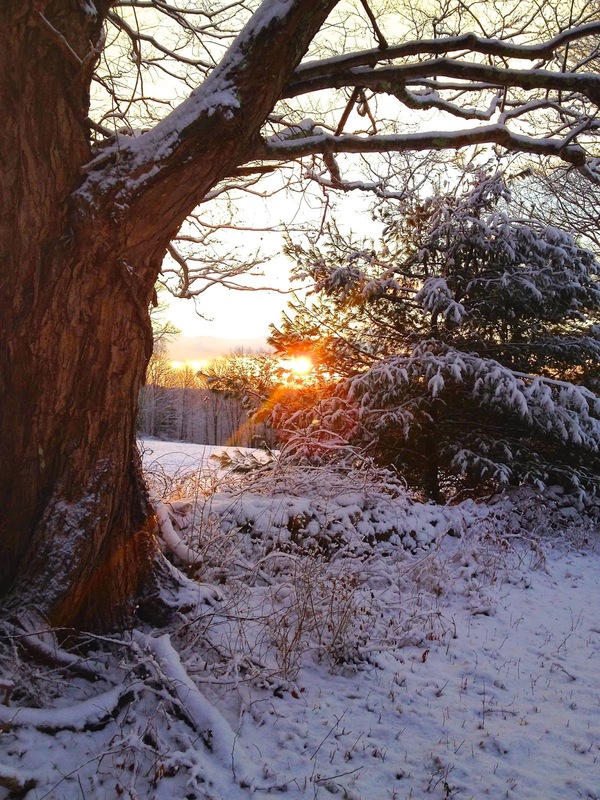 Diane, Love, love the photo of the sunset…it is truly beautiful! I also enjoyed this salad…however I ate mine for lunch and it needed just a bit more substance for a lunch salad, I added some goat cheese and thought some nuts would have also gone well with it! Nice post! Happy Friday and Valentine’s Day!! Yes, cheese and walnuts... Happy Valentine's Day Kathy. Totally subtle. That's what I loved! Thats what I love about being in this group. Making recipes that I would have over looked. There is a lot to be said about subtle. I was surprised at how much I liked this, too. I found it perfect for a light supper, but can see how it would work as a side for almost anything, too. Definitely wouldn't fill me for a meal. Maybe with cheese and nuts for lunch. I'm too hungry at night to eat a salad... but good for you. Yes, we have had quite enough snow. The snow banks along my driver are taller than we are... Because we live in an elevation and close to a lake, we always seem to get just a few extra inches than people who live a mile or two down the road. I don't think I would mind it as much if it weren't consistently so cold. This salad did make a nice side dish - not one to steal the show, but happy in a supporting role. Nice description so close to Oscar time.. Yes, a supporting role is important. The more I ate it the more I didn't like it so much. The sum was certainly not greater than the sum of its parts and for me that is a requirement in a "salad". Funny, I found this to be a winter salad. Cabbage only seems to appeal to me when it's cold outside. I wonder if the fact that you are not surrounded by white effected your taste for it. I surprised you even made it. You seemed really not interested in comments. Good for you trying it. We really enjoyed this salad, and I have to say I'm a wee bit envious of your snow - we are in the 90's already, and well, I just don't think that bodes well for our summer temps. Have a great Valentine's weekend! I don't even enjoy 90s in the summer. Wow, that is really warm for this time of year. The weather is getting a bit scary. Happy Valentine's weekend to you also... we are preparing for more snow. 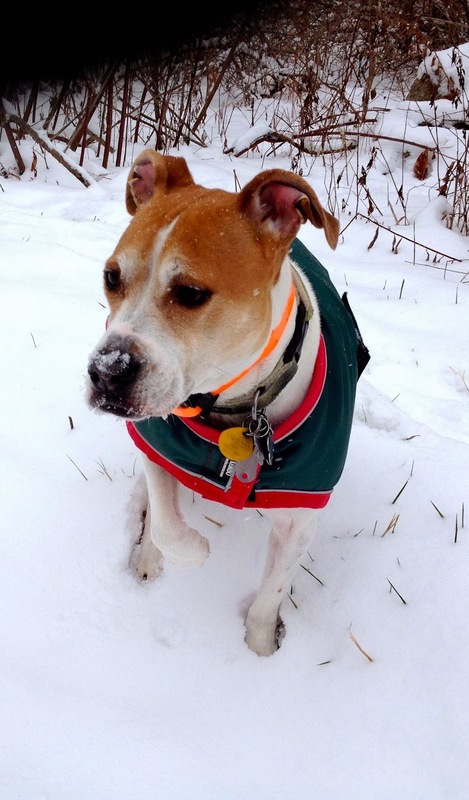 Diane, your dog looks so cute in its sweater:) We have a shih tzu named AJ who does NOT enjoy the snow! Your salad looks good too. We also liked it. My dog would prefer to live down South. In the summer she bakes on our back porch that can be about 100 degrees and in the winter she sits in front of the wood burning stove or has her paws right on a heater in the kitchen. Glad you enjoyed the salad too Guyla. I like it from the get-go! I changed the vinaigrette a lot and used fennel instead of celery It was really nice! Please forgive me but I am so jealous of the snow! I know it is very hard for a lot of people but winter without snow is not winter and this year I feel that I am missing an entire season. We had very little snow in Zagreb. I am not anti-snow. I love it. It's just we have too much for our area. We don't clear it well and we got a sheet of ice on top of it. Fennel sounds like a great idea. I don't remember this much snow since my son was little... a good 10 years ago. The novelty is gone, I just wish it was a little less deep so my dog could run around and get her energy out. Sorry it was not a hit for you. I'm glad that you were pleasantly surprised by this salad. I wasn't a fan. This has been one snowy winter. I agree that it's better when it's pretty, but I've run of out places to put the snow. And more snow is falling outside right now. That is the problem in our town. Because we don't have the resourses to cart away the snow it is becoming a real problem. It is dangerous going around corners the snow banks are so high. Well, it looks like the temps will be up this week so maybe some of it will melt. Crepes this week! You're right, not too exciting looking, but I was excited to see you pup! I'll give Lila your regards Gracie. I'm not much of a salad gal, but I liked this. The sesame seeds you put on top are a nice touch. Thanks I think I will try walnuts next time. I'm glad you ended up liking this one. I agree with your initial assessment - I tend to be more interested in salads with multiple colors. We are going from one extreme to the other from white salad to oollaa crepes. Oooooooo that's just YUMMY..... and something I can eat comfortably, too!